[illegible] Sponge cake with rice Half a pound of flour of rice, half a pound of pounded sugar, twelve Eggs with only half the whites, and the peel of a large lemon grated, beat it well half an hour and continue to do so quite at the Ovens mouth, or it will be heavy. butter your pan and pour it in. Sweet potatoe pudding One pound of potatoes boiled and beaten quite smooth, a quarter of a pound of lump sugar, four Eggs, only one white, the rind of a lemon shred fine, half a nutmeg grated into a quarter of a pound of melted butter, beat it well together, and bake it in a moderate oven. 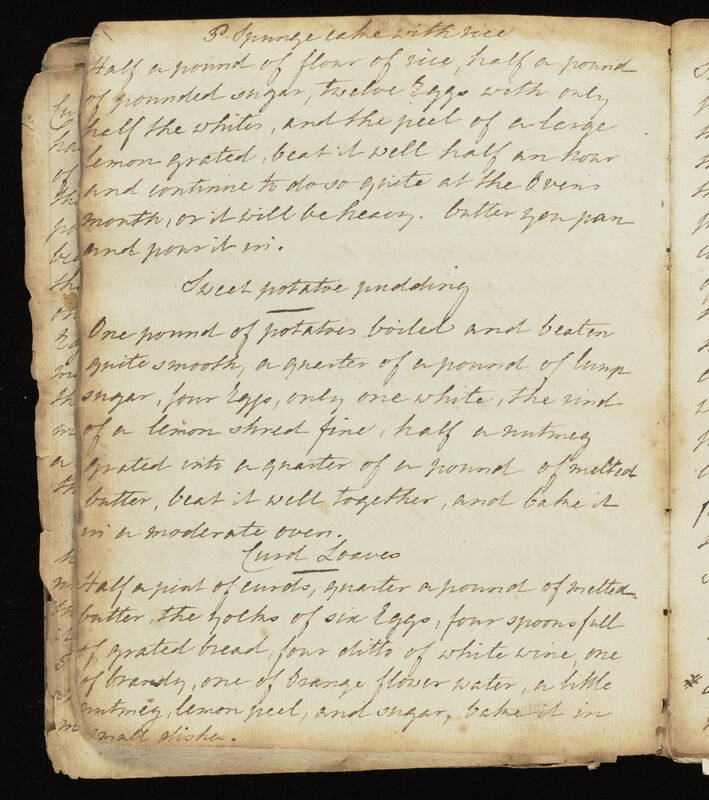 Curd Loaves Half a pint of curds, quarter a pound of melted butter, the yolks of six Eggs, four spoonsfull of grated bread, four ditto of white wine, one of brandy, one of Orange flower water, a little nutmeg, lemon peel, and sugar, bake it in small dishes.